It's a Giant Sperm Whale, you would think it wouldn't need anymore explanation. You have to love museums who build Roadside attractions on this scale. Not only do they want to provide a feast for the eyes, unlike any other attraction you've ever seen, but they also want to educate you. Not only is this sperm whale spectacularly beautiful, you can walk through her too. The entrance is in the side, right next to the eye of course and the exit takes you out the tail. It gets better, she also talks doing a little mating call for your listening pleasure. You would think this would be enough for visitors. I mean when else do you get this close and personal with a whale. But she also sprays water out of her blowhole on the top, providing a nice mist of water for visitors. 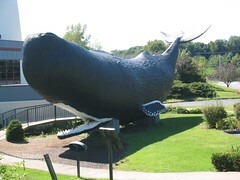 This is the must-see Roadside attraction in Connecticut. It's not just a feast for the eyes, but you might just learn something too!